For other uses, see One Man Band (disambiguation). A one-man band is a musician who plays a number of musical instruments simultaneously using their hands, feet, limbs, and various mechanical contraptions. The simplest type of "one-person band" — a singer accompanying themselves on acoustic guitar and harmonica mounted in a metal "harp rack" below the mouth — is often used by buskers. More complicated setups may include wind instruments strapped around the neck, a large bass drum mounted on the musician's back with a beater which is connected to a foot pedal, cymbals strapped between the knees or triggered by a pedal mechanism, tambourines and maracas tied to the limbs, and a stringed instrument strapped over the shoulders (e.g., a banjo, ukulele or guitar). Since the development of Musical Instrument Digital Interface (MIDI) in the 1980s, musicians have also incorporated chest-mounted MIDI drum pads, foot-mounted electronic drum triggers, and electronic pedal keyboards into their set-ups. Guitarist Jim Garner played guitar with his hands and triangle with his feet, and Will Blankenship of the Blankenship Family of North Carolina played harmonica, autoharp and triangle shows in the 1930s. In the 1940s, entertainer and clown Benny Dougal used a crude "stump fiddle" (a single string stretched on a stick) with a footpedal-operated pair of cymbals. Blues singers such as "Daddy Stovepipe" (Johnny Watson) would sing, play guitar, and stomp their feet for rhythm, or used a foot pedal to play bass drum or cymbal. One of the earliest modern exponents of multiple instruments was Jesse Fuller. Fuller developed a foot-operated bass which he called the 'footdella', which had six bass strings which were struck by hammers. In "one-man-band" shows, Fuller would use his "footdella", a footpedal-operated sock, a homemade neck harness (for a harmonica, kazoo and microphone), and a 12-string guitar. Fate Norris, of the Skillet Lickers, a hillbilly string band of the 1920s and early 1930s developed a geared mechanical contraption with footpedals that enabled him to play guitar, bells, bass fiddle, fiddle, autoharp and mouth harp. Joe Barrick, who was born in Oklahoma in 1922, wanted a way of accompanying himself on fiddle, so he built a contraption with a guitar neck on a board with footpedals to operate the notes. Subsequent versions of this 'piatar' also had bass guitar and banjo necks and a snare drum which are played by foot-operated hammers. To change notes on the guitar-family instruments, a foot treadle operates a mechanical fretting device. Two notable one-man blues bands active in Memphis in the 1950s were Doctor Ross and Joe Hill Louis, playing guitar, harmonica and bass drum/high-hat. The simple guitar and harmonica combination (as used by such musicians as Tex Williams, Anton Newcombe, Jimmy Reed, Bob Dylan, Neil Young, and Ray Dorset of Mungo Jerry) is so common now that it is rarely considered to be a one-man band. British-born Don Partridge made the classic one man band outfit (bass drum on the back, guitar and harmonica) famous in the streets of Europe, and was probably the first ever busker to enter the Top Ten of the UK Singles Chart, with his hit singles "Rosie" and "Blue Eyes" in 1968. Modern one-man bands include such performers as Ben de la Garza, Hasil Adkins and Sterling Magee, better known as "Mister Satan," from Satan and Adam. "The one-man band exists, in all its uniqueness and independence, as a most elusive yet persistent musical tradition. As a category of musicianship it transcends cultural and geographic boundaries, spans stylistic limits, and defies conventional notions of technique and instrumentation. Defined simply as a single musician playing more than one instrument at the same time, it is an ensemble limited only by the mechanical capabilities and imaginative inventiveness of its creator, and despite its generally accepted status as an isolated novelty, it is a phenomenon with some identifiable historical continuity." The term "one-man band" is also colloquially used to describe a performer who plays every instrument on a recorded song one at a time, and then mixes them together in a multitrack studio. While this approach to recording is more common in electronica genres such as techno and acid house than traditional rock music, some rock performers such as Joe Hill Louis, Stevie Wonder, Prince, Lenny Kravitz, Paul McCartney, Emitt Rhodes, Todd Rundgren, Steve Winwood, Roy Wood and Les Fradkin have made records in which they play every instrument. Mike Oldfield was noted for using this recording technique during the recording of his 1973 album Tubular Bells. Other examples of a one-man band in the recording studio are Dave Grohl for the first studio album by the Foo Fighters, Trent Reznor for Nine Inch Nails, Peter Tagtgren for Pain (musical project), Chris Carrabba for the first two albums released by Dashboard Confessional, Varg Vikernes for Burzum and Billy Corgan for Smashing Pumpkins since 2009. Nash the Slash not only plays all instruments on his recordings, but has been giving solo concerts since 1975, using synchronized drum machines and synthesizers as he plays either an electric violin or electric mandolin. One-man bands in this context have recently become more commonplace in extreme metal, especially black metal, where a number of bands apart from Burzum consist of only one member. Such artists include Nargaroth, Xasthur, Falkenbach, Arckanum, Nortt, Horde, Zenithrash, and others. While most of these bands do not play live, some such as Nargaroth hire additional musicians for live performances. "One-woman band" is not used very often in the vernacular, but in the last century as gender inequality has been addressed in the free world, women have increasingly had a presence as musicians in most forms of music. An example of a one-woman band is Merrill Garbus, who performs as Tune-Yards and plays every instrument on all recordings. A recently emerging musical tool is the use of recording, delay, and looping devices in live performances of everything from beatboxing to classical violin, in order to create layered looped accompaniment for music later in the song. Using this technology, a simultaneous combination of various instruments and vocals, or one instrument played in different ways, can be created over the course of one musical piece which rivals studio recording. Notable artists who incorporate this technique live include Keller Williams, That 1 Guy, Zach Deputy, and KT Tunstall. Since the development of Musical Instrument Digital Interface (MIDI) in the 1980s, musicians have also incorporated chest-mounted MIDI drum pads, foot-mounted electronic drum triggers. Some "one man bands" use organ-style pedal keyboards to perform basslines. A small number of MIDI enthusiasts use custom-made MIDI controllers connected to different parts of their bodies to trigger music on synthesizers. Custom-made MIDI controllers range from wind-operated controllers to small triggers mounted on the arms or feet. At a certain point, the use of body MIDI controllers may come to resemble performance art, because the musical sounds are triggered by the performer assuming certain poses or dancing. The term is also used in a general sense to refer to a person who runs a business alone, particularly if the operation requires that person to assume multiple different roles, in a manner akin to the way a musical "one man band" performer plays different instruments at the same time. In the world of TV news, it refers to a reporter who also functions as his own camera man via the use of a tripod. In the 2011, professional wrestler Heath Slater climbed to fame with nickname "The One-Man Rock Band", which was later changed to "The One-Man Southern Rock Band" in reference to him being billed from West Virginia. At Wrestlemania 28, Slater offered to provide vocals for multi-platinum recording artist Flo Rida who rejected the offer profusely, along with the offers of spinning the records and displaying new dance moves which was also denied by Flo Rida. 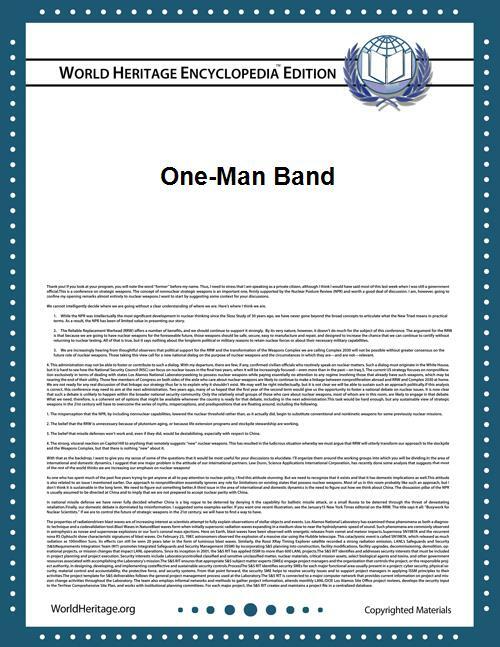 One Man Band Club The One Man Band Club is a Facebook page dedicated to communication and collaboration between the one man/woman bands of the world. Joe Barrick's One-Man Band The story of Joe Barrick, a one-man band, and the history of the one-man band in general.